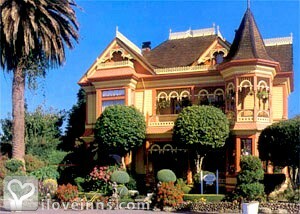 Ferndale bed and breakfast travel guide for romantic, historic and adventure b&b's. Browse through the iLoveInns.com database of Ferndale, California bed and breakfasts and country inns to find detailed listings that include room rates, special deals and area activities. You can click on the 'check rates and availability' button to contact the innkeeper. The state of California has long considered Ferndale to be a historical landmark. The main reason for this distinction is also what prompts visitors to come and return if they have been here. Its original Victorian buildings have been preserved well through the years. These buildings collectively called as the Butterfat Palaces are the pride of Ferndale. They were built during the time when the city's dairy industry was still at its most lucrative. Being a coastal city, Ferndale is also fortunate to offer motorists the amazing view of the ocean. The most popular drives include the Mattole Road and the Lost Coast Scenic Drive. To learn about the city's past, visit the Ferndale Museum. This s located right at the heart of the Ferndale. To tour the city in the most convenient manner, take the Fern Cottage Tour. This can be arranged a Ferndale bed and breakfast inn. By Shaw House B&B Inn.